Local election observers have been advised to work impartially and shun media during the December 30 polls. Speakers at the ‘Election observers training workshop’ also asked them to remain alert against vote rigging. Dhaka University Vice-Chancellor Prof Dr Md Akhtaruzzaman, chief guest at Saturday’s programme at the Jatiya Press Club, asked the observers to maintain rules and regulations. Election Monitoring Forum (EMF), which organised the workshop at the Jatiya Press Club, said the goal was to train all observers. EMF Executive Director Prof Mohammad Abed Ali said it was not possible to visit all the polling stations. “Some stray incidents might occur but we cannot use them to make the national election questionable,” he said. Observers from 25 EMF organisations and 26 NGOs from India, Nepal, Bhutan, Sri Lanka, Malaysia, Japan, Canada and Australia will observe the polls, Abed Ali said. “So, we have to be careful and honest,” he said. The EMF executive director told the local observers to avoid interacting with the media during polls. “We will set up monitoring cells to keep in touch with the media. If you see any irregularities, contact them,” he said. Last month, the Election Commission advised the observers to shun the media on the polls day. “They must stay at polling stations like statues, even if there are irregularities,” EC Secretary Helaluddin Ahmed had said. 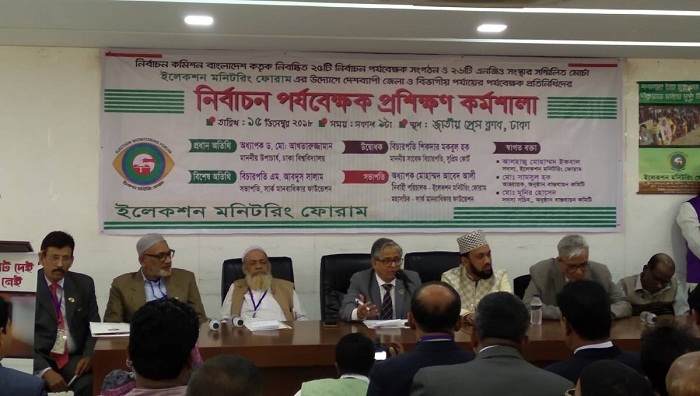 Justice M Abdus Salam, president of SARC Human Right foundation; retired Supreme Court justice Shikder Mokbul Hoque, and EMF member Mohammad Iqbal, among others spoke at the workshop conducted by Rakib Al Mahmud.